Your two dimensional interpolation function works great. You obviously put a lot of work into it. Well done. There are a few different types of interpolation techniques. One relies on creating a curve of best fit taking into account the entire data set. This is addressed in the topic Trendline Coefficients and Regression Analysis. Another technique uses piecewise linear interpolation. As the name implies it fits a straight line to each consecutive pair of data points and uses the appropriate straight line for interpolation. It is this technique that is discussed in this section. Other techniques rely on smooth curves that pass through all the data points. These typically are Cubic Spline or Bezier curves and are outside the scope of this section. Also, suppose that the ranges containing the X and Y values are named XVals and YVals respectively. If necessary, use Insert | Name > Define... to name cell ranges. Note that the x values must be sorted in ascending order. Given any data set (such as the one if Figure 1 above), and a target X value, the first step is to find the 2 X-values that bracket it. These 2 values will correspond to x0 and x1. Use the MATCH function to find which x-value corresponds to x0 for this targetVal. Name the cell containing the formula with the MATCH function as MatchIdx. It is possible to simplify the analysis with other built-in Excel functions. The FORECAST function is normally used for interpolation with an entire data set. However, if its arguments are only two data points, its result will be the same as a piecewise linear interpolation. One can also use the OFFSET function to further simplify the formula. There are instances when a VBA function might be easier to use than worksheet formulas. One instance would be error handling. The above solutions work just fine as long as the target X value is well behaved. Enter a value larger than the largest value in the X range and the result will be #REF! or #DIV/0! Yes, one could expand the formula to trap errors but that would make the formula unwieldy. LinearInterp = .Description & "(Number= " & .Number & ")"
So far we have looked at interpolation where there is only 1 independent variable (given by x). Now, we look at interpolation with 2 independent variables. In other words, we have some variable z that depends on two independent variables, x and y. This is given by the formula z= f(x,y). By analogy to the 1D case, interpolation requires that we specify two points (x0, y0, z0) and (x1, y1, z1) and the value (x2, y2) where x0 ≤ x2 ≤ x1 and y0 ≤ y2 ≤ y1. This will let us calculate the corresponding z2 value. The math is not presented here but it is a straightforward extension of the above case. First, calculate two intermediate values based on the known x-values. 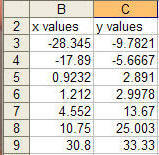 Then, we use these intermediate values to calculate the result using the known y-values. One example of such a data set is shown in Figure 2-1. In this case, one may want to find the value of the function for say x=0.5 and y= 0.5. Another scenario where interpolation may be required is with missing data. Instead of Figure 2-1 where each (x,y) pair has a corresponding z value, consider Figure 2-2 where not every (x,y) pair has a corresponding z value. The VBA code below carries out piecewise linear interpolation with two independent variables. There are two functions available for worksheet use. The first, Interpolate2DArray, applies to the case where one can specify the known x, y, and z values in contiguous ranges. The function itself calculates the required (x0, x1) and (y0, y1) brackets. This corresponds to the data in Figure 2-1. Z-values: Known z-values. A single 2D range or a 2D array. X-values: Known x-values. A single 1D range (or 1D array) with the same number of rows as in Z-values. Y-values: Known y-values. A single 1D range (or 1D array) with the same number of columns as in Z-values. X2, Y2: The function returns the z value corresponding to this (x,y) pair. An example of this function is shown below. The second function, Interpolate2D, requires that the brackets be specified and would be more appropriate for Figure 2-2. Z-values: Known z-values. Four z values corresponding to the points (x0,y0), (x0,y1), (x1,y0), and (x1,y1). Does not have to be a single range. X-values: Known x-values. Two values: x0, and x1. Does not have to be a single range. Y-values: Known y-values. Two values y0, and y1. Does not have to be a single range. The common code required by both functions is at top followed by the two functions themselves. InY2 is a single value. Interpolate2DArray = .Description & "(Number= " & .Number & ")"